As afternoon came we pulled in to a Walmart parking lot where we could get free (strong) wifi and brought up our Allstays app to find a place to stay for the night. 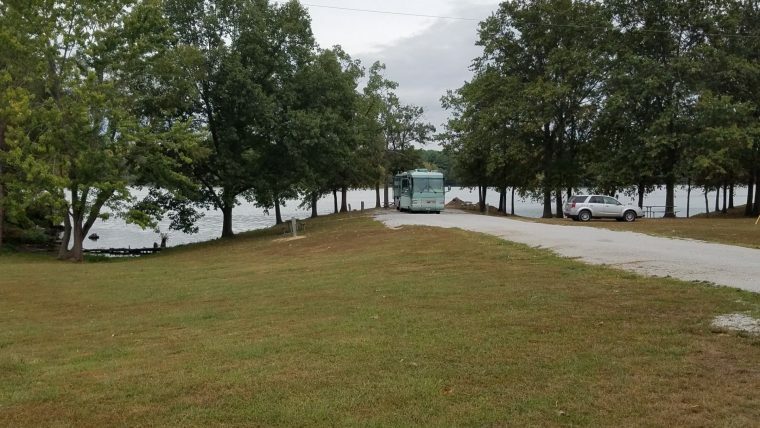 We were lucky enough to choose Lake Vandalia Campground at Vandalia, Illinois. This is a city park with a huge lake, beach area with concession stand and about 100+ electric only sites. There is a dump station that’s free to use for registered guests. Water hydrants are available, but you might need a couple hundred feet of hose. We carry 90 gallons in our fresh water tank, so we had no worries. The fee was only $15 (senior discount) and we were lucky enough to be one of only about 3 or 4 campers there for the night. We backed in to our spot, set up our chairs at the edge of the lake, cooked brats on the charcoal grill and had a peaceful and cool night listening to the light rain that started about midnight. Oh, and Kathy made Acorn Squash in her Instant Pot …. I didn’t think I would like it, but you know … put enough butter and brown sugar on about anything and it’ll taste good! I gotta admit …. it was yummy. All in all, it was another great place to camp for the night … and inexpensive to boot!